Pack a transparent tunic in your suitcase, or an elegant beach dress for a walk by the sea after sun bathing on hot summer evenings. 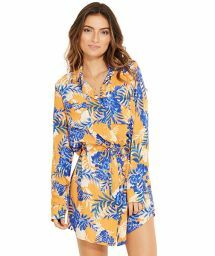 Whether you prefer them long and split in a chic classic version or shorter and printed to show your pretty tanned legs, our tunics and beach dresses will give you the style you want in no time at all. Play with the latest fashions by alternating embroidered tunic, dress shirt or lace, light kaftan, fringed kimono... Add some fashion accessories, a pair of trendy glasses and "voilá"! Guaranteed success, fabulous holiday pictures with flawless summer looks. An embroidered bohemian spirit tunic, a short or long beach dress printed or with lace, a wispy kaftan or a fashionable kimono... Discover all tunics and beach dresses in our e-shop! If you are on the lookout for a stylish cover-up to match your new swimsuit, you may choose between two options: sarongs and tunics. By choosing our cover-ups, however, you are to get the “best of both worlds”. 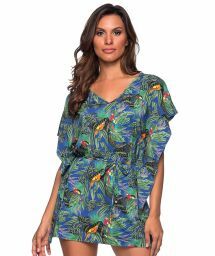 In fact, our cover-ups are specifically designed to emphasize the female curves and are made from top quality fabrics. They come in a wide range of colours and patterns, but they all have a common denominator: beauty. Depending on your preferences, you may choose from warm and cool colours, floral patterns and geometric motifs etc…Opt for a low neckline cover-up if you want to enhance your décolleté and make sure it matches your Brazilian bikini for a stunning result.